Meet Bugsy. He was a partbred Quarter Horse I rescued years ago. When he came to me, he was significantly underweight, suffered from an old stifle injury, and had a distrustful attitude. A few months later, he’d filled out, ran up and down hills with ease, and showed the curiosity and warmth of a youngster. How old was he? 25. Not old by today’s standards and yet, definitely up there. What made the difference? Nutrition. The underweight horse can be very challenging. First, try to determine the reason for weight loss. Saliva production diminishes. A senior-friendly diet considers your horse’s reduced saliva production, which makes dry food difficult to chew and nearly impossible to swallow. This natural aspect of aging is easy to manage by simply moistening your horse’s feed; he’ll appreciate having his meal a little on the mushy side. And be sure there is water close by. Choose senior feeds. Senior feeds are pre-cooked and extruded (formed into kibbles) that are easy to chew and digest. Many senior feeds add digestive enzymes to their formulas to further assist with digestion. They also contain vitamins and minerals, but keep in mind that the only way your horse will get enough of these nutrients is if you feed the recommended amount. Otherwise, a vitamin/mineral supplement may need to be added. Finally, opt for feeds that are organic or at least non-GMO in order to keep him healthier and reduce inflammation. Or choose beet pulp or hay pellets. These make excellent carrier feeds for your supplements. A non-GMO beet pulp or hay pellet is best. They need to be moistened into a mush. You’ll want to add a digestive enzyme supplement, along with proper vitamin/mineral supplementation. Feed the hindgut microbial population. These microbes are responsible for digesting fibrous portions of the diet, leading to the formation of volatile fatty acids to provide your horse with calories for energy. They are also necessary for B-vitamin production and maintaining a healthy immune function. Their numbers can significantly diminish due to several causes, such as stomach acid reaching the hindgut because of an empty stomach or inadequate saliva production (saliva neutralizes acid), pain and mental stress, illness, antibiotics, or feeding GMO feeds (that may be sprayed with Roundup). Pro and prebiotics are often added to senior feeds or supplements designed for aging horses. Include a source of omega 3s. The essential omega 3 fatty acid, alpha linolenic acid (ALA) must be in your horse’s diet because his body cannot produce it. Hay that has been stored for several months no longer has the levels once contained in living grasses. ALA supports immune function, reduces the inflammation of aging joints and muscles, regulates blood insulin levels, promotes healthy skin and hooves, and improves attitude. Stabilized flaxseed meal and chia seeds are excellent sources of omega 3s. They are well tolerated and easy to feed. For more difficult cases of inflammation, add additional omega 3s in the form of DHA as well. Supplement vitamin C. Vitamin C is necessary for collagen production (protein found in bones, joints, and blood vessels). It is also a potent antioxidant and natural antihistamine. When young, your horse was capable of producing plenty of his own vitamin C. Now that he’s getting older, his ability has diminished. He’ll get ample vitamin C from fresh pasture, as long as it is growing and healthy; but hay has virtually no vitamin C.
Avoid high starch feeds. Cereal grains (oats, corn, barley, wheat, rice, etc.) and feeds made from cereal grains should be eliminated from the diet. As horses age, they are more inclined to exhibit signs of equine Cushing’s disease and a low starch diet is best. As your horse starts to show signs of aging, the diet you’ve been feeding may now be obsolete and in need of an adjustment. The underweight horse can be very challenging. First, try to determine the reason for weight loss. Worm infestation, ulcers, infections, liver or kidney disease, even cancer can cause weight loss. Pain and mental stress can also make it difficult for your horse to hold a normal weight. 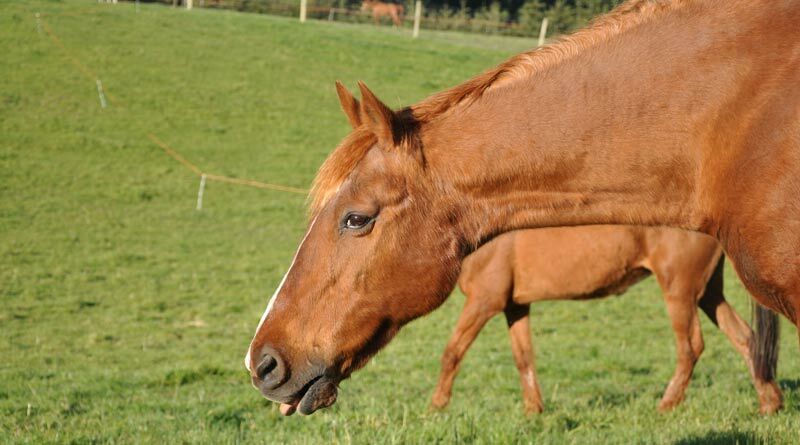 The most common reason for weight loss in older horses, however, is poor teeth. Soaked hay cubes or chopped forage, fed free-choice, will meet forage requirements. Extra calories can be provided in a variety of ways but avoid cereal grains. Horses are more prone toward developing Cushing’s disease as they age and should be fed a low-starch diet. Additional fat through ground flaxseeds or chia seed are safer ways to help your horse gain weight without the risk of starch. Additional protein from alfalfa, and especially hempseed protein, will boost protein quality to help maintain muscle mass, while adding extra calories. A good pre/probiotic will allow for more calorie production from the hindgut microbes. As horses age, they are more inclined to exhibit signs of equine Cushing’s disease and a low starch diet is best. Tendons and ligaments lose elasticity over time and muscle mass starts to decline. There are several nutrients that I find helpful in boosting joint and connective tissue strength and lean body mass. These include colostrum, branched chain amino acids, B vitamins, vitamins C and E, and others. More detailed information on feeding horses is found in Feed Your Horse Like A Horse, as well as in the Spotlight on Equine Nutrition series book, The Aging Horse. I’d like to see the reference for GMO feeds being harmful. Genetically-modified foods as a whole are not intrinsically harmful for horses or humans, as has been demonstrated by multiple, quality peer-reviewed studies. In some cases, food sources incorporating GMOs are necessary to feed the animals (horses and humans) in a growing global population. In addition, horses have a different bacterial community in their guts than humans do — in fact, a good research study to that effect was shared not long ago on this very platform — so simply “feeding probiotics” may not be all that helpful if the chosen product is based on human gut needs. The bacteria which make any probiotic effective also generally can’t survive extreme heat or cold, so a tub of something sitting on the average horse owner’s barn shelf or on a pallet at a feed store or on a shipping truck quickly becomes useless if not climate-controlled.